The aggressive Rim Fire has been destroying California since August 17 and its not letting up! It is now claimed as the 4th largest fire in California’s history! 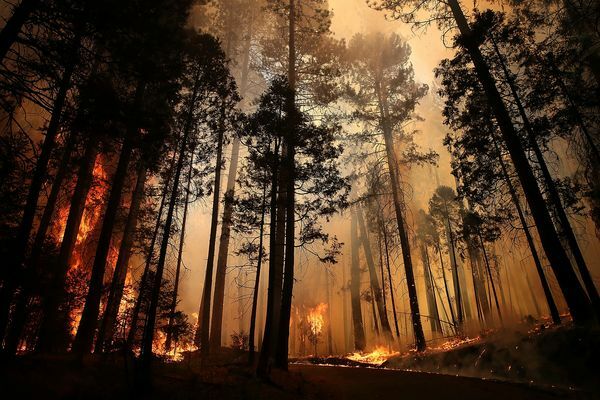 So far, the Rim Fire has burned 223,000 acres (40,000 acreas was Yosemite). More than 100 structures have been lost and the fire has a containment date on September 20. The hot weather and lightning isn’t helping this fire reach containment either. Right now across the U.S., over 8,000 firefighters are fighting 6 major fires. Thinking of everyone in the area – it is so devastating. Thoughts are with all the fire fighters who do such an awesome job. Even though we don’t have huge fires like that in New England, I feel for everyone in that area and hope that the fire will be contained very soon. Unfortunately, more hot, dry, and potentially windy weather appears to be on it’s way to the area in the next week or two. Best of luck to the firefighters. Such a beautiful area. Hope the fire is contained soon. Strength to the fire fighters. Reblogged this on Drowning in Desire. It always feels weird to push the “like” button for posts about potential disasters, but I think its important to let people be aware of fire danger. You do a great job choosing your subject matter so that things are interesting, informative, and still focused on your… well….focus! thanks. 80% contained as of today, the rim fire has lucky not taken any lives so far – but has left an imprint on the northwestern part of Yosemite I wish I had explored more before this happened! Makes you realize you got to enjoy what you have while you have it!